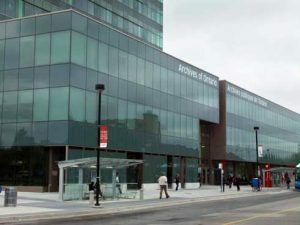 A must for those researching their ancestors in Ontario is the Archives of Ontario located in Toronto. In addition to the Ontario births, marriages, and deaths, they have immigration, wills, estate and land records. If you can’t make it to Toronto, remember that a library near you can order microfilms from the Archives of Ontario through interlibrary loan for you to view within your local library. 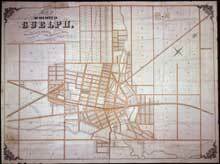 Map of the Town of Guelph, from recent surveys and original maps, May 1855. 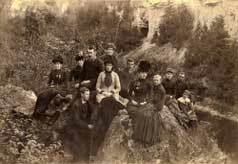 The photograph to the right is from the Connon family fonds, which is a collection of photographs by professional photographers Thomas and John Connon, based in Elora (Wellington County, Ontario). Thank you to the Archives of Ontario for giving us a glimpse into their holdings. Visit their website for more information on their collection of materials for genealogists and family historians.